Cal's Billy Griffith scored a big upset, but No. 2 Stanford defeated the No. 36 Bears 4-1 today in Berkeley. Griffith, a senior from Fresno ranked 79th, beat Tom Fawcett, ranked 14th, 6-4, 7-6 (4) on Court 1. No. 32 Axel Geller, a freshman from Argentina, clinched the match for the Cardinal (10-1) with a 7-6 (9), 2-6, 6-3 victory over J.T. Nishimura, a senior from San Jose, on Court 2. Geller, who ended 2017 as the world's top junior, is featured in "Faces in the Crowd" in this week's Sports Illustrated. Several Stanford players will compete in the Pacific Coast Doubles Championships in La Jolla next weekend before dual-match play resumes against Arizona State in Tempe, Ariz., on March 8. Cal (3-4) will play at San Diego State on Thursday and then in the Pacific Coast Doubles tournament. The West Coast Tennis Tour will debut this spring and summer with 13 open prize money tournaments from San Diego to Seattle. The coed circuit will begin May 20-21 and May 27-29 in San Diego and end Aug. 8-13 in the San Francisco Bay Area suburb of Moraga at the Moraga Country Club. The only other Northern California tournament on the tour is scheduled for June 8-11 in Danville, also in the Bay Area, at the Crow Canyon Country Club. "We want to get young players to compete more," tour organizer West Nott, a former USC women's assistant coach, said in a news release. "The tour is geared toward high school and college players who are seeking more pressure-filled match play. All levels are welcome. This is one giant road trip, and we are connecting all the dots A to Z for a memorable life experience and seeing sights along the way." All results will go toward a player's Universal Tennis Rating. For more information on the West Coast Tennis Tour, visit westcoasttennistour.com. Nott also will host a trip to the NCAA Men's and Women's Team Championships, May 17-22 at Wake Forest University in Winston-Salem, N.C., for juniors 13-18. For more information, go to info@collegetennistours.com. Elise Mertens became CiCi Bellis' latest high-profile victim today. Bellis, an 18-year-old wild card who was born in San Francisco and raised in nearby Atherton, dispatched Mertens, an Australian Open semifinalist last month, 6-3, 6-3 in the opening round of the Dubai (United Arab Emirates) Duty Free Tennis Championships. Mertens, a Belgian ranked 21st, won only 29 percent of the points on her second serve (8 of 28) versus 50 percent (13 of 26) for Bellis, ranked 41st, in their first career meeting. Bellis will face Garbine Muguruza, ranked third and seeded second, for the first time in Wednesday's late match at about 9 a.m. PST. Muguruza, who won the French Open in 2016 and Wimbledon last year, received a first-round bye. A victory over Muguruza would be the biggest of Bellis' career, topping her win over No. 5 Karolina Pliskova in the third round at Doha last week. It also would be Bellis' fourth triumph over a Grand Slam singles champion after her victories over Jelena Ostapenko (who later won the French Open), Petra Kvitova and Svetlana Kuznetsova. ATP World Tour -- In a battle of California natives, 20-year-old Taylor Fritz edged fourth seed and 2016 champion Sam Querrey 2-6, 6-3, 7-6 (4) in the first round of the Delray Beach (Fla.) Open. The 30-year-old Querrey, originally from San Francisco, played two days after he lost to Kevin Anderson, also in a third-set tiebreaker, in the final of the inaugural New York Open in Uniondale, N.Y.
Top-ranked Wake Forest won its first national championship today, defeating No. 7 UCLA 4-2 in the ITA National Men's Team Indoor Championships in Seattle. Skander Mansouri, ranked 22nd, clinched the match for the Demon Deacons (9-0) with a 6-4, 7-6 (7) victory over No. 107 Keegan Smith on Court 3. Wake Forest's Bar Botzer, ranked 112th, topped Logan Staggs, a senior from Tracy ranked 58th, 6-4, 6-4 on Court 4. The Demon Deacons overcame deficits of 1-0 and 2-1. The match between top-ranked Martin Redlicki of UCLA (11-2) and 100th-ranked Borna Gojo on Court 1 was abandoned at one set apiece and 40-40 in the first game of the third set. 2012 World TeamTennis match in the Sacramento area. Today's final between top-seeded Kevin Anderson and second-seeded Sam Querrey, a 30-year-old San Francisco native, in the inaugural New York Open came down to a tiebreaker. But Anderson reeled off the first six points, leading the normally mild-mannered Querrey to slam his racket on the court, and then won 4-6, 6-3, 7-6 (1) in Uniondale, N.Y. The 6-foot-8 (2.03-meter) Anderson slammed 16 aces in the match, and the 6-foot-6 (1.98-meter) Querrey had nine. Each player double-faulted once. Anderson won all four of his matches in three sets, three of them in third-set tiebreakers, after receiving a first-round bye. The 31-year-old South African, who lives in Florida with his American wife, won his fourth career title and first since 2015. Anderson had been 3-11 in ATP finals, including a loss to Gilles Simon of France in Pune, India, during the first week of this year. "I have been runner-up quite a few times in my career," Anderson, a former University of Illinois star (2005-07), lamented to reporters. "One of the big goals I had for this year was to try to be a bit more successful in that final stage. I fell a little short earlier this year in India, and it feels great to come through and get today's win. It gives me a lot of confidence for the year." Anderson, the runner-up to Rafael Nadal in the U.S. Open in nearby Flushing Meadows, N.Y., last September, will rise two places to a career-high No. 9 in Monday's rankings. He was ranked 10th for one week in 2015. Querrey, who was seeking his 11th ATP title, would have moved up one spot to a career-high No. 11 with a victory. Anderson improved to 8-9 against Querrey with four victories in their last five matches. They first met in the first round of the 2007 Sacramento Challenger, with Querrey winning 6-3, 3-6, 6-3. College men -- In a match that came down to a third-set tiebreaker, top-ranked Wake Forest beat No. 5 Stanford 4-3 in the semifinals of the ITA National Team Indoor Championship in Seattle. In the deciding match on Court 1, 100th-ranked Borna Gojo edged No. 33 Tom Fawcett 3-6, 7-6 (5), 7-6 (5). The Cardinal (8-1) twice fought back to even the dual match. Wake Forest (8-0) will play No. 7 UCLA (11-1) for the title on Monday. The Bruins, with senior Logan Staggs of Tracy, defeated No. 6 Texas A&M 4-2. Staggs, ranked 58th, beat Valentin Vacherot, ranked 35th, 7-5, 7-5 on Court 4. No. 5 seed Stanford defeated No. 12 Baylor 4-2 today in the first round of the ITA National Men's Team Indoor Championship in Seattle. Eric Fomba clinched the victory for the Cardinal (7-0) by topping 104th-ranked Will Little 2-6, 6-2, 6-2 on Court 4. Stanford's Tom Fawcett, ranked 33rd, routed Bjoern Petersen, ranked 64th, 6-2, 6-1 on Court 1. Stanford will face No. 4 Georgia in the quarterfinals on Saturday. The Bulldogs beat No. 13 Columbia 4-1. Jason Jung could have folded after he was broken while serving for the title in the $100,000 San Francisco Open. He could have folded when he lost three consecutive points, the last two on his serve, to trail 3-4 in the third-set tiebreaker. But the Los Angeles-area native, who plays for Taiwan, recovered to beat Dominik Koepfer of Germany 6-4, 2-6, 7-6 (5) today in an indoor battle of unseeded players at the Bay Club SF Tennis Center. It was the first meeting between Jung, 28, and Koepfer, a 23-year-old left-hander. Jung jumped from No. 205 in the world to No. 155, near his career high of No. 143, with his third Challenger singles final, the second-biggest of his career and his first outside of China. Koepfer, a former All-American at Tulane in New Orleans, rose from No. 285 to a career-high No. 229 after his first Challenger singles final. Jung graduated from the University of Michigan in political science in 2011 and worked for an oil company in his native Torrance for one month before being laid off. He planned to go to law school but didn't do as well on the admission test as he had hoped, so he launched his professional tennis career. Jung broke serve to lead 5-4 in the third set, but Koepfer broke back at love as Jung got tight and made several errors. Koepfer saved a break point to hold for 6-5, and Jung sent the match to a tiebreaker. Jung bolted to a 3-1 lead, but Koepfer rallied for a 4-3 advantage. Koepfer, probably feeling nerves of his own, then double-faulted for 4-4. With Koepfer serving at 5-6, he netted a forehand to end the match after 2 hours, 5 minutes. Jung pocketed $14,400, and Koepfer collected $8,480. Here are the completed singles and doubles draws. Fed Cup -- Canadian captain Sylvain Bruneau substituted 19-year-old Katherine Sebov for former Stanford star Carol Zhao, 22, in today's first match against Romania in World Group II. Irina-Camelia Begu, ranked 37th, defeated Sebov, ranked 319th, 6-2, 6-4 to clinch Romania's 3-1 victory in Cluj-Napoca, Romania. In a meaningless doubles match, Gabriela Dabrowski and Zhao edged Ana Bogdan and Raluca Olaru 6-4, 1-6 [10-6]. The second reverse singles match was abandoned. Zhao, ranked No. 138, lost to No. 38 Sorana Cirstea 6-2, 6-2 on Saturday. Romania was missing its top singles player, No. 2 Simona Halep, and Canada was without its top two singles competitors, No. 116 Eugenie Bouchard and No. 123 Francoise Abanda. Romania advances to the World Group playoffs, and Canada drops to the World Group II playoffs. Jason Jung, a Los Angeles-area native who plays for Taiwan, stunned second-seeded Mackenzie McDonald, a San Francisco Bay Area product, 1-6, 7-6 (3), 6-2 tonight to reach the quarterfinals of the $100,000 Kunal Patel San Francisco Open. McDonald, the runner-up to Kei Nishikori last week in Dallas, double-faulted on Jung's second match point in the indoor tournament at the Bay Club SF Tennis Center. Jung, 28, graduated from the University of Michigan in political science in 2011 and worked for an oil company in his native Torrance for one month before being laid off. He planned to go to law school but didn't do as well on the admission test as he had hoped, so he launched his professional tennis career. Jung, who lost to Nishikori in the Dallas semifinals, will face sixth-seeded Noah Rubin of Long Island, N.Y., in Friday night's late match. Rubin, the 2014 Wimbledon boys singles champion, defeated qualifier Jared Hiltzik of Orlando, Fla., 6-1, 6-4. In another quarterfinal, San Jose product Dennis Novikov will take on seventh-seeded Filip Peliwo of Canada. Novikov, 24, survived his second straight three-setter. He outlasted Daniel Elahi Galan of Colombia 5-7, 6-3, 6-4 after ousting top-seeded Alexander Bublik of Kazakhstan 7-6 (10), 3-6, 6-2 on Tuesday night. The 6-foot-4 (1.93-meter), 200-pound (91-kilogram) Novikov pounded 15 aces and committed three double faults against Galan. Novikov won 53 percent of the points on his second serve (19 of 36) to only 36 percent for Galan (12 of 33). Peliwo, the 2012 Wimbledon boys singles champion, dismissed wild card Danny Thomas, an 18-year-old left-hander based in Wesley Chapel, Fla.
SAN FRANCISCO -- Patience paid off for Dennis Novikov in a wild first-set tiebreaker on Tuesday night. Top-seeded Alexander Bublik of Kazakhstan double-faulted on the 24-year-old San Jose product's eighth set point, and Novikov went on to win 7-6 (10), 3-6, 6-2 in the first round of the $100,000 Kunal Patel San Francisco Open indoors at the Bay Club SF Tennis Center. Novikov won the last four games. Bublik, 20, had a set point serving at 7-6 in the tiebreaker, but his backhand slice down the line sailed wide. Novikov admitted it was difficult to keep his composure in the tiebreaker. "Definitely," he said. "He let me off the hook a little bit as well when he was serving for it and didn't convert. Tennis can go either way based on a couple of points. I just tried to stick with it." Bublik, who according to at least one pro has top-10 potential, double-faulted three times in the tiebreaker and twice at 2-3, 30-30 in the third set. He finished with 18 aces and 11 double faults. "That's the way he plays," Novikov said of Bublik going for big second serves. "He also had some games where he hit big second serves, and he came back with them in games where I should have broken. When you play like that, it kind of comes and goes. You take it as it is." It's the third consecutive week in which Novikov played the top seed in the opening round. He ousted former world No. 4 Kei Nishikori, who had been out since August with a right wrist injury, 6-3, 3-6, 6-4 two weeks ago in Newport Beach and lost to Nishikori 6-3, 6-3 in Dallas. Nishikori went on to win the Dallas title, beating San Francisco Bay Area product Mackenzie McDonald in the final. "It's unlucky, I guess," Novikov said. "But I know if I come out and play to my level, it doesn't matter what seed it is. At the end of the day, you have to go through all of them to win the tournament. Obviously, it would be nice to play them in the final and get a little easier draw, but either way, you've got to beat them, so I was ready." Novikov lives in downtown Los Angeles, but his parents reside in Milpitas in the Bay Area. "I'm up here visiting pretty often," he said. "I still consider myself from the Bay Area." Bublik, who was not available for comment, lost in the first round of a Challenger for the second consecutive week and fell to 2-5 this year after reaching a career-high No. 95 last September. Russia natives Bublik, 6-foot-5 (1.96 meters) and only 167 pounds (76 kilograms), and Novikov, 6-foot-4 (1.93) and 200 pounds (91), met for the second time. Bublik won 6-1, 6-4 in the quarterfinals at Aptos, 82 miles (132 kilometers) south of San Francisco, en route to the title last August. Novikov had sprained an ankle playing in Cabo San Lucas the previous week. After the Aptos final, runner-up Liam Broady of Great Britain said of the hard-hitting Bublik, "I don't see why he can't be top 10." Unlike in Aptos, the right-handed Bublik wore a sleeve on his right arm on Tuesday night. However, the arm did not appear to trouble him. Bublik qualified for the Australian Open and Wimbledon last year, upsetting then-No. 16 Lucas Pouille of France in the first round in Melbourne and falling in straight sets to then-No. 1 and defending champion Andy Murray at the All-England Club. Bublik also reached the quarterfinals indoors in Moscow on the ATP World Tour in 2016 and 2017, ousting then-No. 23 Albert Ramos-Vinolas of Spain in the second round last year. Novikov advanced to the second round at the U.S. Open in 2012 and Wimbledon in 2016. He gained his first ATP quarterfinal last July on grass in Newport, R.I.
Bublik, who lost in the second round of qualifying in the Australian Open this year, has dropped to No. 132. Novikov is No. 215, down from his career high of No. 119 in August 2016. In Tuesday night's last match, the second-seeded McDonald beat wild card Florian Lakat of France 6-4, 6-4 in a matchup of 22-year-olds. McDonald was born and raised in Piedmont, across the bay from San Francisco, and Lakat starred at Cal, a 15-minute drive north of Piedmont. All four seeds in action during the day session, including three Americans, won in straight sets. No. 3 Michael Mmoh, a semifinalist last year at 19, dispatched wild card Christian Garin of Chile 6-2, 6-3 in their first career meeting. Mmoh, the American son of former Nigerian pro Tony Mmoh, reached his first quarterfinal on the ATP World Tour in Brisbane, Australia, last month as a qualifier. He took out then-No. 33 Mischa Zverev of Germany in the second round. Garin qualified for Wimbledon last year and fell to Jack Sock, ranked eighth at the time, in the opening round. Garin also won the French Open boys singles title five years ago, beating Alexander Zverev (Mischa's younger brother) in the final. In the current rankings, 6-foot-6 (1.98-meter) Alexander Zverev is No. 5 at 20 years old, and the 6-foot-1 (1.85-meter) Garin is No. 298 at age 21. No. 5 Bradley Klahn, who graduated from Stanford in 2012, topped Marcelo Arevalo of El Salvador 7-6 (1), 6-3 in a battle of 27-year-olds to even their head-to-head series at 1-1. Arevalo, a former Tulsa star, won 7-5, 6-4 in the first round of qualifying at a $50,000 Challenger on outdoor clay in Vicenza, Italy, last May. Arevalo reached the doubles final in the $100,000 Tiburon Challenger last fall with Miguel Angel Reyes-Varela of Mexico. The lost to Lakat and his former Cal teammate Andre Goransson of Sweden. Affluent Tiburon is situated across the Golden Gate Bridge from San Francisco. Two former Wimbledon boys champions, Noah Rubin (2014) and Canada's Filip Peliwo (2012), also advanced. Rubin, seeded sixth, beat Jose Hernandez-Fernandez of the Dominican Republic 6-1, 3-0, retired (right thigh). 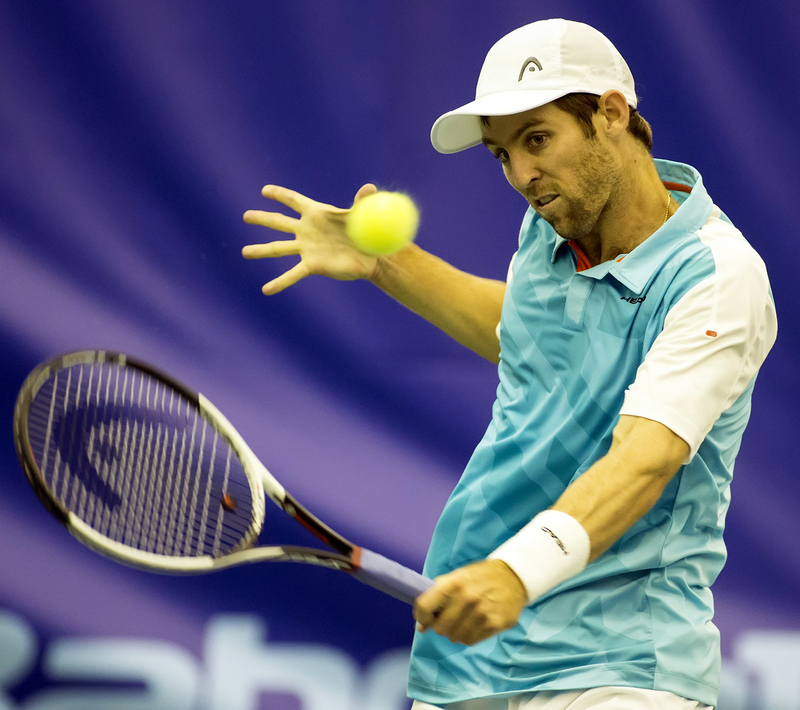 Peliwo, seeded seventh, eliminated 34-year-old qualifier Maximo Gonzalez of Argentina 6-4, 6-2. Here are the San Francisco Open singles and doubles draws and today's schedule. Denis Kudla continued his strong start in 2018. Continuing his strong start in 2018, fourth-seeded Denis Kudla of Arlington, Va., and Tampa, Fla., defeated Ante Pavic of Croatia 6-4, 7-6 (4) tonight in the first round of the $100,000 Kunal Patel San Francisco Open at the Bay Club SF Tennis Center. Kudla, a quarterfinalist in San Francisco last year, reached the second round of the Australian Open as a qualifier last month. He upended countryman Steve Johnson, ranked 48th at the time, in the first round and led Austria's Dominic Thiem, then No. 5, two sets to none before falling. Kudla also advanced to the semifinals of last week's $125,000 Dallas Challenger, losing to Mackenzie McDonald of Piedmont in the San Francisco Bay Area. McDonald, seeded second in San Francisco, is scheduled to play wild card Florian Lakat, a former Cal standout from France, after Tuesday's featured match at 7 between top-seeded Alexander Bublik of Kazakhstan and Dennis Novikov, a 24-year-old San Jose product. Kudla, ranked a career-high No. 53 in 2016, tumbled to No. 207 last October. He has since climbed to No. 166. Kudla, a 25-year-old Ukraine native, attributes his hot start to harder offseason training. "I did a lot more cardio ... so I could sustain a higher level of tennis for a longer period of time," he said on atpworldtour.com. "That was a big thing. I knew the game was there, but I kept dying at a certain point, and I realized I just wasn't in good enough shape. I thought I was, but I wasn't. So that was the biggest thing. When I know I'm in shape, the game is there. It was always been there." Earlier today, 18-year-old Serbian phenom Miomir Kecmanovic ousted eighth-seeded Brayden Schnur of Canada 6-4, 7-6 (2). In the final round of qualifying, 17-year-old Jenson Brooksby of Sacramento lost to 34-year-old Maximo Gonzalez of Argentina 6-4, 6-2. Here are the qualifying, singles and doubles draws and Tuesday's schedule. Jenson Brooksby, 17, of Sacramento beat eighth-seeded Franco Agamenone of Argentina 7-5, 6-1 today to reach the final round of qualifying in the $100,000 Kunal Patel San Francisco Open at the Bay Club SF Tennis Center. Brooksby will face another Argentine, 34-year-old Maximo Gonzalez, on Monday at 1 p.m. The 403rd-ranked Gonzalez, only 5-foot-9 (1.75 meters) and 165 pounds (75 kilograms), dominated Sem Verbeek, a former University of the Pacific standout from the Netherlands, 6-3, 6-2. Patel was a tennis enthusiast who died in a 2014 bicycle accident at 27. He was scheduled to leave for London one week later with friends to watch the ATP World Tour Finals. Here are the San Francisco Open qualifying, singles and doubles draws and Monday's schedule. With Dennis Novikov's luck, he shouldn't bet on the Super Bowl. The 24-year-old San Jose product drew the top seed for the third consecutive week in the Kunal Patel San Francisco Open. Novikov will face Alexander Bublik of Kazakhstan in the $100,000 tournament, which begins Monday at the Bay Club SF Tennis Center. Novikov upset former world No. 4 Kei Nishikori, who had been out since August with a right wrist injury, in the opening round in Newport Beach two weeks ago and lost to Nishikori last week in Dallas. Nishikori, the 2014 U.S. Open runner-up, went on to defeat Mackenzie McDonald, from Piedmont across the bay from San Francisco, 6-1, 6-4 in the Dallas final on Saturday. Bublik, a 20-year-old Russia native, won a $100,000 Challenger in Aptos, 82 miles (132 kilometers) south of San Francisco, last August. McDonald, seeded second, will meet wild card Florian Lakat, a 22-year-old former Cal star from France. McDonald won the $100,000 Fairfield Challenger near San Francisco last October and reached the second round of the Australian Open as a qualifier last month. Lakat won the doubles title in the $100,000 Tiburon Challenger with former Cal teammate Andre Goransson of Sweden last fall. Tiburon is located across the Golden Gate Bridge from San Francisco. Third-seeded Michael Mmoh, a San Francisco semifinalist last year at 19, will play wild card Christian Garin of Chile. Fifth-seeded Bradley Klahn, a 27-year-old former Stanford star, drew Marcelo Arevalo of El Salvador. Neither 2017 champion Zhang Ze of China nor runner-up Vasek Pospisil of Canada is entered this year. Here are the San Francisco Open singles qualifying and main draws and today's schedule. A trip to Serbia normally spells trouble for the United States Davis Cup team. But with Serbia missing its top three players, towering Sam Querrey and John Isner gave the United States a 2-0 lead today on indoor clay in Nis in the first round. It still wasn't easy, especially without the No. 1 American. Sam Querrey, a 6-foot-6 (1.98-meter) San Francisco native, pounded 20 aces in a 6-7 (4), 6-2, 7-5, 6-4 victory over 88th-ranked Laslo Djere in the opening match. Isner, 6-foot-10 (2.08 meters), blasted 24 aces in a 6-4, 6-7 (6), 6-3, 3-6, 7-6 (4) win over 84th-ranked Dusan Lajovic. Absent are No. 13-ranked Novak Djokovic, No. 38 Filip Krajinovic and No. 67 Viktor Troicki for Serbia and No. 8 Jack Sock for the United States. Djokovic, formerly ranked No. 1, announced today that he had a "small medical intervention" on his right elbow. Querrey is ranked a career-high 12th, and Isner is 18th. The United States can clinch the best-of-five series in Saturday's doubles match, in which Ryan Harrison and Steve Johnson will face Nikola Milojevic and Miljan Zekic. Harrison won the French Open last year with Michael Venus of New Zealand.